Shredding documents is a highly beneficial process to protect your data within businesses and organisations. A reputable shredding service will shred your documents on-site to better suit your data destruction process. Shredding paper on-site gives peace of mind. It offers security and reassurance to organisations. An organisation can in fact nominate a representative to view the destruction through a monitor on the side of the truck. Either system ensures that ALL DATA is shredded BEFORE leaving a site. All material is destroyed beyond recognition. 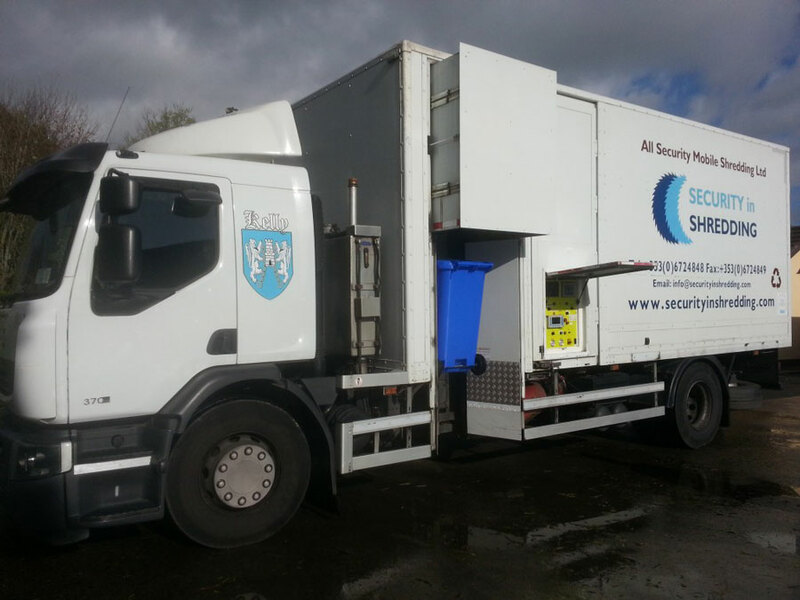 We supply the highest standard, most efficient mobile shredding machine on the Irish market. This system includes the supply of secure wheelie bins and a regular call-out service to our customers. Our operators do not see or touch any documents before they are shredded. The output of the shredding machine is 2.5 tonnes per hour, the equivalent to a 240 litre wheelie bin per minute. As a result, we use the minimum amount of time while providing our customers with the most professional and efficient service possible. We provide a variety of services to better suit your needs or destruction process. We can shred your documents on a specific date available. Clients can call our trained staff and make an appoint for our truck to come out to your base of operation. Or a once off large shred of Clear out shredding is also available. Due to the efficiency of our on site mobile shredding units we have the capability to destruct high volumes of material efficiently. This service can also be scheduled by contacting our staff. This entry was posted in Confidential Shredding, Corporate Social Responsibility, Data Destruction, Data Protection, Paper Shredding, Recycling and tagged Confidential Shredding, Data Protection, Onsite Shredding, Secure Shredding by Security in Shredding. Bookmark the permalink.